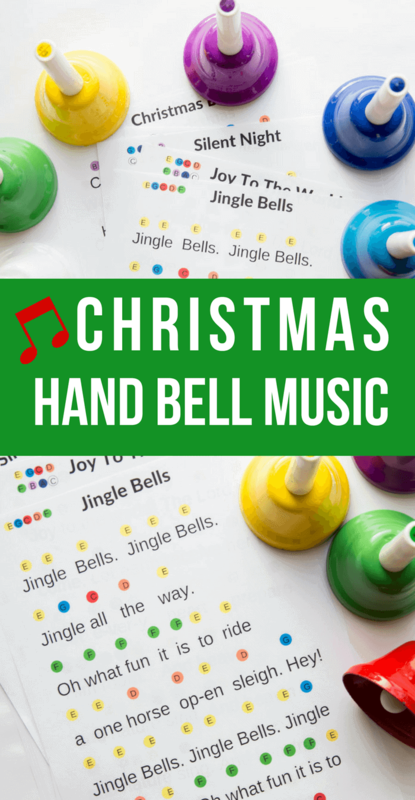 Christmas Hand Bell Songs- A Family Holiday Tradition - So Festive! Looking for a fun and musical family Christmas tradition to start? Learn to play Christmas songs with hand bells! Our memorable Advent Night ended with our entire group singing Christmas songs while playing hand bells. It was spiritual, fun, and definitely brought the Christmas spirit. And that’s when we became hooked with hand bells! You see, I’m not one with great musical talent. But hand bells, that I can do! Anyone can play the hand bells, unless you are color blind, I suppose. That memorable advent night sparked a desire in me to invest in my own set of hand bells so that I could carry on this fun Christmas tradition with my own little family. As our children grow older, I love that they will be able to participate in playing Christmas songs well before they develop great musical abilities. When I started looking into hand bell sets, I was surprised to see so many options out there. 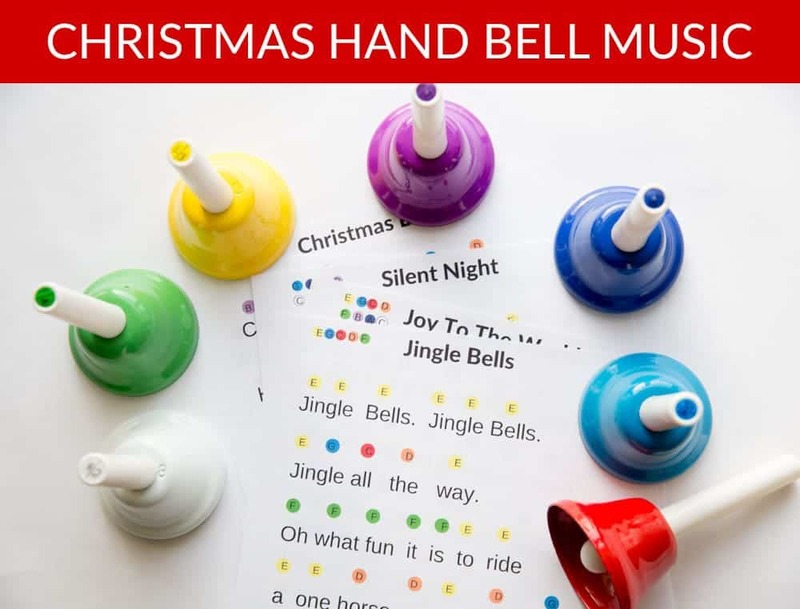 I knew that for our purposes of playing Hand bells at Christmas time and the occasional preschool group or music time throughout the year with our Classic Hand Bell songs , a simple 8-note set would do just fine. As in, we weren’t going to become famous Hand Bell choirs any time soon. There are no repeat colors used. Some sets have 2 different reds instead of white, and I thought that would be too confusing! Once I got our Hand Bell set the next step was to create posters with all the Christmas songs we would want to play. Our first Advent Night, my husband and I were hand coloring circles on large posters literally minutes before our Sing-a-long started. And then we ran out of space and we messed up on colors, so that first night didn’t go as smooth. I knew there had to be a better Hand bell music option. 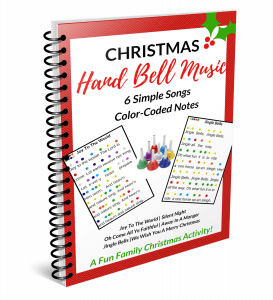 My search began for Christmas Hand Bell music online and couldn’t find any song sheets that were already made, simple to read and follow, or that matched with the colors used on my hand bells. And the few options I did find were too expensive. So I got to work and created hand bell music sheets just the way we wanted them! 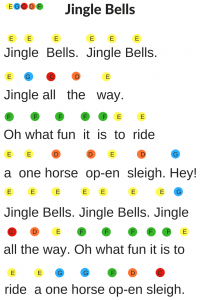 After years of working on these Christmas Hand bell song sheets, I am finally able to share them with you! If you’re looking for inexpensive hand bell music, you’ll love these! Color-coded notes above each word/syllable. 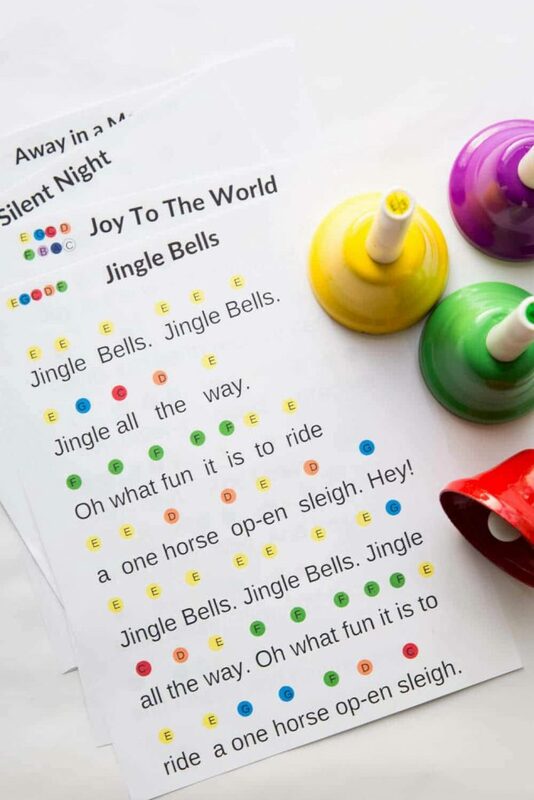 The note is also listed in case your hand bell set uses different colors or you want to play along on a different instrument. The text is large! And the lyrics are included. The printables are formatted for large poster size (24 x 36) or letter size (8.5 x 11), depending on what you need them for. And the digital copy is great for on-the-go. If you’re looking for Christmas hand bell music, I’ve got you covered! Want Your Own Inexpensive Copy? Check out the Classic Hand Bell songs, too! I hope you enjoy this fun way to bring the spirit of Christmas into your home for the holidays! If there are any additional songs you’d like to see, let me know in the comments below! Do you have other 8 bell books? I am looking for some old time favorites, and for older children. Thanks!